Are you aware of what internet speeds you’re paying for? Do you know whether you’re actually receiving those speeds or not? Most people know how fast their internet should be, but not enough are aware of whether their internet service provider (ISP) is actually delivering those speeds. To determine if your ISP is living up to its end of the bargain, you can leverage internet speed tests. Several reputable companies operate speed tests these days, so today we’ll take a look at the Verizon speed test to see if it’s a good option. Is your internet as fast as it should be? 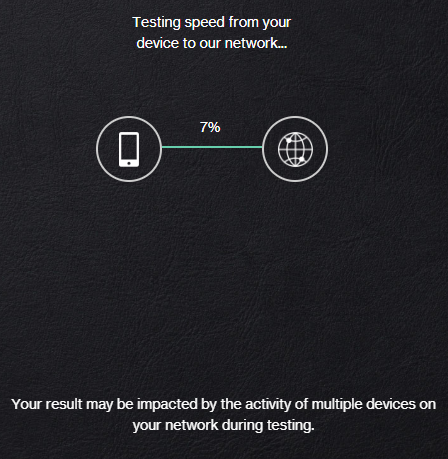 Run a speed test and find out! To ensure reliable and consistent results on our end, we run each test five times from the exact same location. We also use multiple devices (desktop PC, laptop PC, smartphone) to make certain that our hardware isn’t affecting the test in any meaningful way. We run the tests with no programs running other than the Google Chrome browser, and we disable any active plugins. These steps allow us to create a repeatable testing scenario, which enables us to properly evaluate the speed test’s ability to measure download speed, upload speed, and ping/latency. 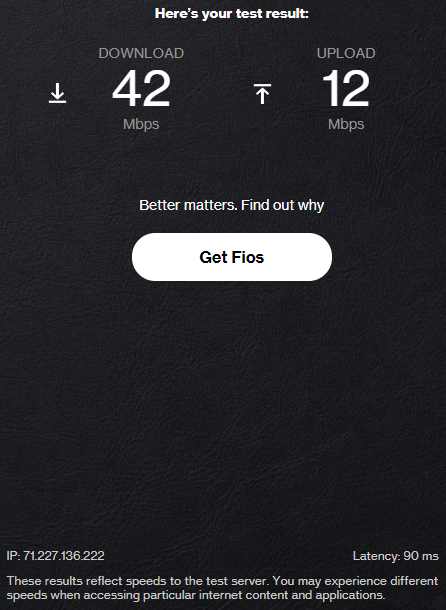 To analyze the Verizon Fios speed test, we used a connection that typically delivers speeds around 250 Mbps, and we tested our connection on other competing speed tests to see how well Verizon matched up. Unfortunately, the results were incredibly inaccurate. Not only did Verizon’s test fail to properly analyze the speed of our connection, it also takes nearly a full minute to run ― many other speed tests take about half as long. We took some screenshots of the tests ― which you can find below ― so you can get a feel for their interface. When it came to the results, the Verizon internet speed test took an average of 2.4 seconds to load, and 55.4 seconds to operate. The mean of the measured download speeds was 43.8 Mbps, with an average upload speed of 11.6 Mbps. Meanwhile, the ping took about 87.2 ms, whereas most competitors keep latency results as low as 8 ms. The Verizon internet speed test loads quickly, with no noticeable wait time involved. The presentation is also uncluttered and user-friendly, which certainly can’t be said about some of their competitors. In addition, the test runs on a secure site, and they list your IP address on the test results screen. The first and most obvious problem is that the results of this test simply cannot be trusted. The ping/latency times are over 10 times longer than those recorded on competing speed test sites, and the download speeds are wildly inaccurate. Not only do the download speeds recorded by Verizon vary considerably ― from 25 Mbps to more than double that (54 Mbps) ― they also aren’t even close to the speeds recorded by other tests. Verizon also doesn’t tell users where their testing location is, an issue that ties back into the trustworthiness of the results. The server could be in the same room you’re in, or it could be thousands of miles away, and we simply wouldn’t know the difference ― although we strongly suspect that Verizon only has a small handful of testing sites, and therefore would rather hide this info than show their hand. Finally, this test takes much longer to run than nearly any other speed test available online. In fact, most internet speed tests take half as long as Verizon’s does. Simply put, the Verizon internet speed test is too unreliable to produce any meaningful results. While the test loads quickly, looks pretty good, and runs on a secure site, the functionality of the test itself falls flat. With inconsistent download speeds ― both regarding the results compared to each other, as well as to speeds recorded by other tests ― and the longest ping and/or latency times we’ve recorded on any speed test, there just isn’t any valuable information to be gleaned from the Verizon Fios speed test. At the end of the day, we cannot recommend the Verizon speed test to any of our readers. Especially when there are some truly excellent internet speed tests available, there’s no reason to waste your time with an incomplete and slapdash tool like this one. How good is your internet speed?